Growing up a New York Yankees fan, I know the importance of a good team captain. I heard all about Thurman Munson and had the privilege of following the Yankees when Derek Jeter carried that distinct honor. That position is usually given to not only the best player on the team, but the most respected as well. Usually the owner and coach bestow that title onto a deserving individual or it’s presented after a vote from his teammates. That was the case for two-time All-American, Iolas Huffman. Born February 4, 1898, Iolas Melitus Huffman was the youngest of five boys raised on the family farm in Spratt, Ohio, a few miles east of Chandlersvillle. Coming from an athletic family, Iolas was toughened up by two of his older brothers, Jim and Walker. Iolas was a star baseball player in his youth and later at Ohio State. His older brothers taught him to be a baseball catcher by putting him in front of the barn door and throwing the ball at him until he learned to catch it. The three of them made up a third of the local baseball team near Chandlersville. Iolas never saw a football game until he enrolled at Ohio State. He was walking by practice one day in 1918, when he decided he wanted to give it a try. Because of World War I, freshmen were permitted to play varsity football that season. Due to this rare exception, Huffman ended up lettering all four of his years at Ohio State and played "every quarter of every game save one." Huffman was always quick to credit assistant coach, Walter Essman, for his success. The line coach noticed something in Iolas immediately and often took him down by the river for extra work, teaching him techniques to become an effective blocker and tackler. As a sophomore in 1919, Iolas played a big part in helping the Buckeyes capture their first ever win against archrival Michigan. Early in the game, he broke through the Michigan line and blocked a punt with his teammates falling on it in the end zone to give OSU their first score of the game. That’s all the points they would need as they went on to the 13-3 win that changed football in Columbus forever. Ohio State shutout their next two opponents to set the table for a possible undefeated season and potentially the school’s first national title. It wasn’t meant to be though as they were upset by Illinois, 9-7, on a field goal in the final seconds of the season finale to finish with a record of 6-1. Despite the disappointing finish, there was plenty to celebrate. On December 10, 1919, at the annual football banquet, it was announced that Iolas Huffman would captain the Buckeyes during the 1920 season. It came as a surprise to some with half back Pete Stinchcomb expected to step out of the shadow of Chic Harley after Ohio State’s premiere back exhausted his eligibility. Huffman would prove worthy, putting together his most memorable football season in a Buckeyes uniform in 1920. Ohio State ran the regular season table, finishing 7-0 and 5-0 in the Western Conference. Iolas blocked yet another Michigan punt by All-American Frank Steketee, which the Buckeyes recovered in the end zone again to pull off the exhilarating 14-7 win. They’d defeat Illinois the next week in dramatic fashion to capture the school’s third conference title in seven seasons. 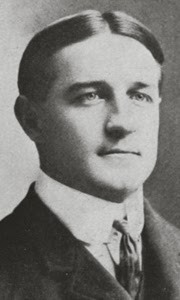 Cyril “Truck” Myers caught a long pass from Harry Workman as the gun blasted and ran it across the goal line for the game’s only score in a 7-0 OSU victory. The win also catapulted Ohio State to its first ever Rose Bowl appearance. The Buckeyes lost 28-0 and were no match for a California Bears team that had outscored their opponents 510-14 on the season and were retroactively named National Champions by five different organizations. The season highlight against Illinois not only lifted OSU to a conference championship, but propelled Truck Myers to being named captain for the 1921 season. Huffman’s senior year would be slowed by injuries on the gridiron. He hurt both his leg and shoulder that season and the Buckeyes were upset by Oberlin in the second game, 7-6. The Buckeyes traveled to Ferry Field in Ann Arbor on October 22nd. After Huffman’s game-winning punt blocks in each of the two previous encounters, Michigan’s legendary coach Fielding Yost was going to ensure that the Ohio State All-American was not going to single-handedly beat his Wolverines again. Knowing of Iolas’ leg problems, Yost told his team prior to the game, "One leg or two legs, two men on Huffman." Ohio State had a balanced effort and won the game with defense, shutting out Michigan, 14-0. The Buckeyes had a chance to tie Iowa atop the Western Conference standings in the season’s final game, but lost 7-0 to Illinois. This was perhaps the most talented collection of coaches in the history of the conference with names such as Fielding Yost, Howard Jones, Amos Alonzo Stagg, John Wilce, and Bob Zuppke roaming the sidelines. After the season, the Lima News celebrated Huffman’s career by writing he was “hailed as probably the greatest tackle in Buckeye history.” He was voted an All-American in both 1920 and 1921 by Football World magazine after collecting the opinions from over 250 college coaches. In all, Iolas totaled seven varsity letters, three in baseball and four in football. Baseball was always Huffman’s first love though. At the conclusion of his college career, he was offered a contract by the St. Louis Browns. For years, Iolas carried around a letter in his wallet from Ty Cobb asking him to try out for the Detroit Tigers. A sore arm eventually forced Huffman out of semi-pro baseball and he decided to return to football. In the spring of 1922, he also received the Western Conference Scholarship Medal, given annually by each member institution to a single graduating student-athlete that “attained the greatest proficiency in athletics and scholastic work.” The award, since renamed the Big Ten Medal of Honor, began in 1915 and still stands as one of the most prestigious awards given by any conference in the country. Huffman was inducted into Ohio State’s Varsity “O” Hall of Fame in 1980. He played tackle in the NFL for the Cleveland Indians and the Buffalo Bisons in 1923 and 1924, respectively. With the help of his $50-a-game professional football paycheck, Iolas put himself through medical school. He’d study medicine during the week, take a train on a Friday night, practice with the team on Saturday, and play a game on Sunday. In all, he played a total of 13 NFL games in two seasons. After completing medical school, Huffman became a doctor for the town of Ravenna from 1924 until the early 1980’s. There was a period of time when Dr. Huffman delivered most babies born in the Northeastern Ohio town. Iolas Huffman passed away from natural causes in Cleveland at the age of 91 on November 12, 1989. He was cremated and some of his ashes were spread around his All-American tree in Buckeye Grove and some were sprinkled on the turf at Ohio Stadium. Iolas will be forever known as “Cap” because of the amount of respect that teammates, coaches, and even the opposition had for one of Ohio State’s greatest linemen and a supreme captain.